Very little in life means more to me than Children’s Literature – and there’s no other art in which Britain is so conspicuously the world leader. The Grimm brothers aside, where would Disney be without Milne, Barrie, Carroll, Grahame, Travers, etc. etc… With this life-long obsession in mind, while still an undergraduate at the very end of the last century, I made the brave but steadfast decision to devote my life to writing for a young audience. At that stage, the name ‘Harry Potter’ meant nothing to me, nor to most people. In the decade and a half since, any claim to a children’s writing ambition has become akin to saying ‘I wanna be a pop star’ or ‘I wanna go to the moon’. It now seems to be a dog-say-uncalled-for-things-about-other-dog-behind-dog’s-tail world in children’s publishing, and the odds of any unknown writer’s work reaching school libraries must now be only a small fraction of what they were when I decided that this was what I wanted to do. Nonetheless, nothing can ever stop me inventing stories, characters and jokes for kids, and in my mag career I’m proud to have been editor of Pokémon World (Where I created Professor and Stu Yew), the 2003 Finding Nemo special and Disney’s Puzzle Land, and even more bursting with pride to have written dozens of stories for Disney’s Girl, Disney & Me, Muffin the Mule and many others, as well as having my own tale ‘Little Wee’ published as part of the ‘Homespun Threads’ collection, raising money for children’s theatre. With so many different stories still to be told – as listed on my Children’s Writing CV – have no fears or complacency that I will give up just yet. 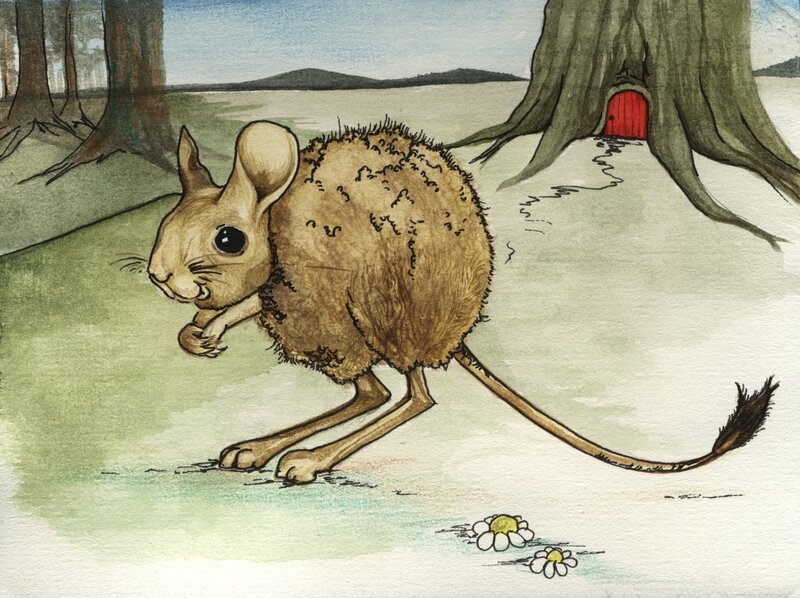 The Wooly Jerboa illustration ©Yolanda Kelly 2005.